We study cross-regulation of gene expression by hormone signaling pathways during seedling growth. The phenotype of an organism results from a vast number of information inputs that change over time. Inputs come from both internal and external factors, such as weather conditions, pathogen attack and the activity of hormone signaling pathways. Dynamic regulation of transcription is a key point at which inputs are integrated and processed to determine phenotypic outputs. 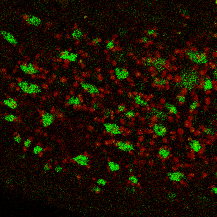 This occurs through changes in the activity and binding of TFs that may regulate gene expression both positively and negatively. An individual TF binds to the promoters of hundreds or thousands of genes, acting as an information input to the expression of those genes. Tens of TFs may be bound simultaneously to the promoter of any given gene. 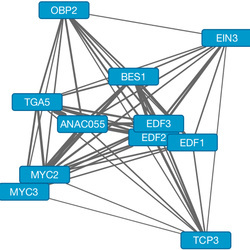 The final transcriptional output of each gene is therefore determined by a complex interaction between many different TFs. Fluctuations in expression of that gene reflect changes in the population of bound TFs. The major hormone signaling pathways interact in complex ways, both synergistic and antagonistic. Each pathway regulates dynamically a suite of TFs that affect expression of downstream genes. These pathways influence growth and development of plants throughout their lifecycle. The result is a highly complex network of interactions that change over time. We study the interactions between hormone signaling pathways using genome-scale techniques (chromatin immunoprecipitation sequencing - ChIP-seq) to measure binding of TFs, differential gene expression (RNA-seq) and associated protein activity (proteomics, phosphoproteomics). Our targets are the major plant hormone signaling pathways, including jasmonic acid, ethylene and salicylic acid. Data are integrated using bioinformatic and systems biology techniques with the ultimate goal of generating models describing seedling growth. The project is based in the Ecker lab, with whom we collaborate. Germination is a critical step in plant growth. No other developmental program will proceed if it is not completed successfully. Nutrient resources and responses to the environment vary dramatically between seeds of different plant species. However, the core theme of germination is the occurrence of a dynamic developmental process following the correct environmental stimuli. This involves extensive transcriptional reprogramming. We are taking a systems biology approach to investigate changes in transcriptional networks during seed germination, applying high-throughput sequencing technologies. A systems-level understanding of the transcriptional networks that regulate germination will greatly enhance our understanding of plant growth and development. We relate TFs to specific transcriptional programs and to observable phenotypes using dynamic modeling approaches. Moreover, we relate interspecific differences in germination to variation in transcriptional regulation to better understand the biology of different seed types. Small RNAs (sRNAs) of 24 nucleotides are associated with transcriptional gene silencing by targeting DNA methylation to complementary sequences. 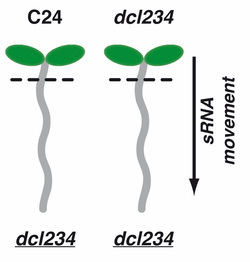 We demonstrated previously sRNAs move from shoot to root in Arabidopsis, where they regulate DNA methylation of three endogenous transposable elements (TEs). However, the full extent of root DNA methylation dependent on mobile sRNAs was unknown. We have found that DNA methylation at thousands of sites depends upon mobile sRNAs. This was achieved using methylC-seq to measure DNA methylation genome wide, followed by novel statistical approaches to integrate these results with genome-wide sRNA measurements (sRNA-seq). We pinpoint specific genetic components involved in mobile sRNA-dependent DNA methylation. This methylation targets specific TE superfamilies in and regions of the genome, which suggest potential functions of mobile DNA methylation. We collaborate with the Baulcombe and Ecker labs on this project. 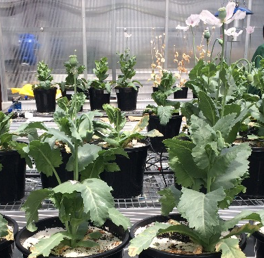 We work in the lab and the field on optimising performance of medicinal plants. These projects combine both fundamental and applied biology, and the team includes members of agronomist Dr James Hunt's lab (La Trobe University, @agronomeiste). They focus predominantly on Papaver somniferum, which produces valuable alkaloids (morphine, codeine, thebaine and others). Our research is conducted in collaboration with a licensed commercial poppy grower, TPI Enterprises, under full state government research licenses for cultivation and analysis of medicinal plants.